In December 19, 2018 President Trump surprised just about everyone when he announced that the U.S. would begin immediately withdrawing its 2,200 military personnel from northeastern Syria. This decision was apparently the result of a phone call with the Turkish president that took place a few days earlier on December 14, 2018. This abrupt shift in policy was at odds with previous statements by administration, state, defense, and CJTF-OIR officials. In the months prior to the phone call numerous officials had stressed the long-term commitment to helping the Syrian Democratic Front (SDF). In fact, the initial purpose of the phone call was to warn the Turkish president not to proceed with plans to attack U.S.-backed Kurdish forces in Syria. Instead Trump basically invited the Turks to do what they want in Syria. A part of the conversation included Trump asking the Turkish president if his forces were up to the task of cleaning up the remnants of ISIS. For the last few years, since early 2015, the United States has been providing training, advise, assistance, weapons, equipment, intelligence, and ‘enablers’ to the Syrian Democratic Front. The SDF has been the primary ground force in Syria that has been fighting ISIS. The SDF has been enabled by the U.S. and other Coalition partners with fires support (artillery and mortar) and airstrikes. As a result of SDF military operations the Islamic State has seen its territorial holdings in Syria diminish significantly. Currently, ISIS controls a few pockets of territory along the Middle Euphrates River Valley (MERV). The SDF, assisted by the U.S. and Coalition nations, has liberated more than 20,000 square miles of previously held ISIS territory in Syria. More than 3 million civilians have been liberated from ISIS rule. The SDF is a local Arab and Kurdish military militia. However, the majority of the SDF is made up of fighters from the Kurdish People’s Protection Units (YPG). There are also some smaller ethnic groups in the SDF such as the Yezidis and Syriac Christians. 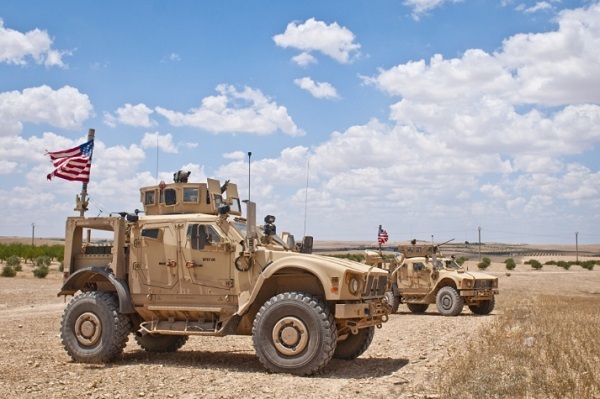 Photo caption: US tactical vehicle provides security on roads near Manbij, Syria. Manbij is an SDF stronghold that separates the SDF enclave from areas held by Turkish-backed Syrian forces. Photo by Staff Sgt. Timothy Koster, Combined Joint Task Force – Operation Inherent Resolve, June 20, 2018. The Islamic State is not quite defeated. There are more military operations that need to be conducted to eliminate the few remaining pockets of IS resistance. In addition, IS has already shifted its strategy from that of a conventional force holding ground to an insurgency. It is now operating in the shadows with small groups of fighters, an intelligence apparatus, and a support structure hidden from view. It has adopted insurgent and terrorist tactics now that its conventional military capability has been significantly degraded. President Trump’s decision to immediately start the withdrawal of U.S. military personnel from Syria puts the fight against IS in jeopardy. If the Kurds lose the support of the U.S. and the Coalition partners then it will be in danger of attacks by the Turkish military and its proxy Syrian militia forces. The Kurds will likely shift their attention from the remaining ISIS pockets and focus on the threat of Turkish incursions. The situation in Syria is certainly complex. Russia, a key Assad ally, does not view the YPG as a terrorist organization. Russia considers Kurdish held territory as a future holding of the Syrian government; not territory that should be ceded to a Turkish occupation. The Syrian government sees any Turkish military presence in Syria as illegal and against its interests. Another major player, Iran, is concerned about ISIS regaining strength in Syria – which could affect the fight against ISIS in Iraq. Turkey would likely meet with varying degrees of resistance from these major players should it attempt to send military forces to the areas where ISIS is currently operating within Syria. However, President Trump says to not worry about ISIS. He has the assurance from President Erdogan that Turkey’s military forces will clean up the remaining ISIS threat. Certainly, this statement will alleviate the concern that some Trump supporters have about abruptly leaving Syria without finishing the mission of killing off the remaining IS fighters. But . . .
A brief look at the map above that depicts which warring faction holds what territory in Syria quickly will cast doubt on Turkey’s ability to chase down and defeat ISIS fighters. Turkish forces are either in Turkey along the Turkish Syrian border or located in a small pocket of Syria (Afrin) to the west of the SDF held territory. The remaining pockets of ISIS are in the central eastern region of Syria along the Euphrates River. It would be extremely difficult for Turkish military forces to conduct operations in the part of Syria where ISIS is currently found without traversing territory (almost 250 kms) held by the Syrian government forces or the SDF. Turkey views the YPG – the Kurdish element of the SDF – as an extension of the Kurdish Workers Party (PKK). The PKK is a Kurdish resistance group in Turkey that has been labeled as a terrorist organization by both Ankara and Washington. The PKK has been conducting insurgent military operations within Turkey for several decades. The Turks would like to eliminate the Kurdish enclave in Syria and establish a buffer zone in Syria south of the Turkish border to provide greater security against possible Kurdish attacks and attempts to support the PKK. Turkish desire to eliminate ISIS as a threat is certainly secondary to its aim to diminish the Kurdish control of northeastern Syria. The Turks are not that concerned about an ISIS organization that has been at war with the Syrian Kurds and the Assad regime. In addition, in order to reach the areas where ISIS now exists the Turks would have to traverse across areas of Syria now held by either the SDF or Syrian government forces. President Trump’s assertion that Turkey will finish the fight against ISIS is misplaced optimism. 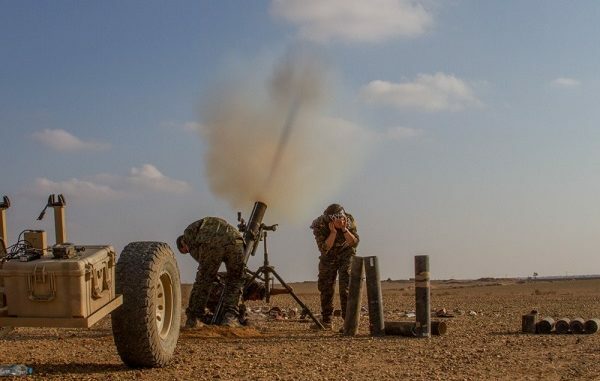 Top photo: SDF mortar team fires 120mm at ISIS target near Deir ez-Zor in the Middle Euphrates River Valley, Syria. Photo by SGT Matthew Crane, CJTF-OIR, November 16, 2018.